We at MangaGamer are proud to announce the upcoming release of Kira Kira Curtain Call, available on April 30th, and Higurashi When they Cry Kai: Tsumihoroboshi, available on April 15th. Our latest release of Higurashi is the 6th chapter in the series, Tsumihoroboshi. All seems to be going well for the characters in this series until Rena’s family encounters its share of trouble. After losing her home and her sense of family once already when her parents divorced, Rena decides to take matters into her own hands and fight back to protect her father. But can she go through with it? Can she really find a way to save her father and bring happiness to them all? And what secrets lie written within Miyo’s scrapbook? Will Rena be forced to face Oyashiro-sama’s curse again this year? Will she be the one to find herself demoned away? Has Keiichi finally started to recall the tragedies that befell him before? Will any of them be able to atone for their sins? The first part of Kira Kira Curtain Call tells the story of students at Oubi academy several years after the original Second Literature Club has moved on with their lives. Shikanosuke’s little sister, Yuko, has grown up to be a bassist at their school, and she’s just as good as he was if not better. 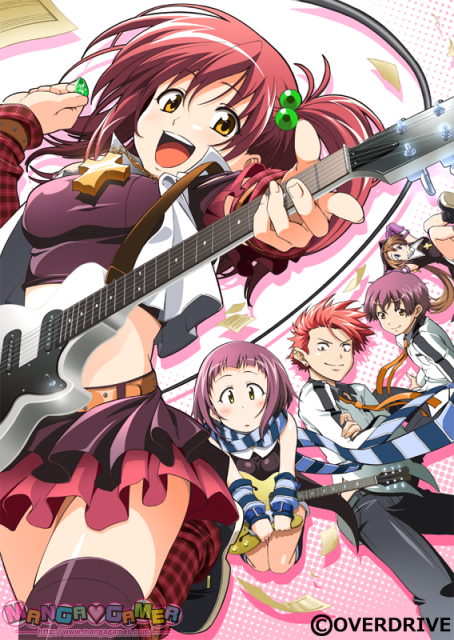 The story focuses on her friends Yui, Souta, and Kazuki. They’ve been together since they were little, and Souta’s love for Yui is obvious. After botching his confession to her, Souta’s been restrained to stay at least three meters away from Yui at all times. But stubborn and hot-headed, he refuses to give up and sets out to impress her and prove that he has talent. 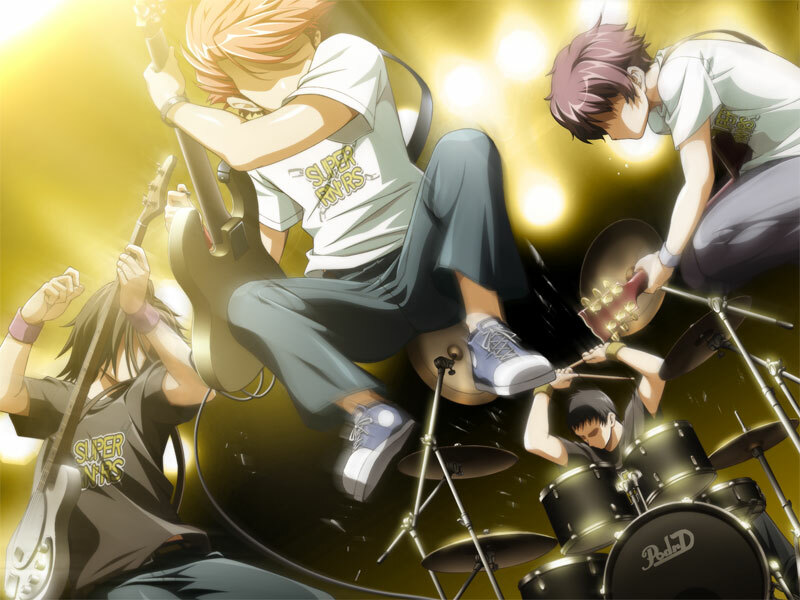 With this goal in mind, he gathers up a few band members and pours all his energy into getting them ready for the end-of-summer battle of the bands, where he hopes to defeat Yui’s generation of the Second Literature Club. His tale follows the story of men with passions, hopes, and dreams as they strive to overcome the trials that face them and succeed in this world. His is a tale that lies close to the hearts of Yashiro and Murakami from the original Kira Kira. Meanwhile, the years have not been so kind to the Second Literature Club’s friend, Murakami, and his band, Happy Cycle Mania. Still nothing more than an indie band with what could be called a cult following, the only major offer they’ve had is for their vocalist, Aki, to become a professional singer. Wanting what’s best for her, he urged her to take the offer which left their band without a vocalist. The band’s 5th anniversary is quickly approaching, and Star Generation’s star-turned-indie-label-producer, Yagihara, is planning a big concert in celebration. As the pressure mounts on Murakami, he finds himself facing his mid-life crisis. Should he continue with the band? 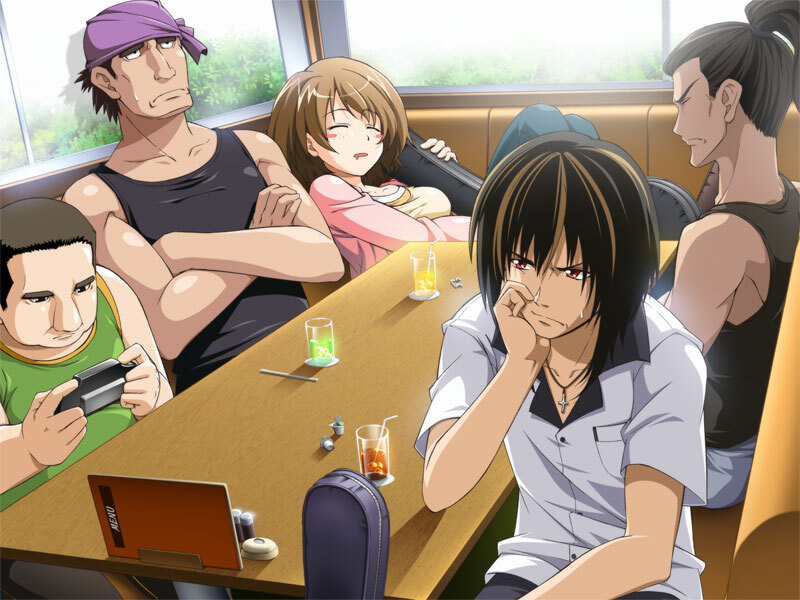 Should he finally give it up and try to pursue a more normal lifestyle like Shikanosuke, Kashiwara, and Chie have? Should he change the direction the band’s heading in, or will it be fine the way it is? As Murakami loses sight of himself, his motivation, and his reasons for forming Happy Cycle Mania, their 5th anniversary continues to draw near. What decision will he finally reach, and who will show up to help him make it? This part is a tale of a mature, established band, and the hardships they face when they realize the difficulty of trying to continue to make a living off of the music industry. Tagged 07th Expansion, Higurashi, Kira Kira, OVERDRIVE. You forgot the K in Keiichi under characters on the Higurashi When they Cry Kai: Tsumihoroboshi page. I noticed they did that. E-mail’s already sent. Looking forward to the fandisc. So I guess this means Koihime Musou will be out in either late May or June? Maybe they’ll release koihime musou in a BOX! Will there are a Kira*Kira + KKCC bundle like the Edelweiss bundle? Sorry, I did forget to mention that. Yes. We are working on a bundle release which will contain both Kira Kira and Kira Kira Curtain Call. The price will most likely be around 46.95 Euros. I’ll mention this again once all the details are finalized. More concerned about the Oubi academy up there. It’s oHbi. Only if you subscribe to crappy romanization standards that turn a long お vowel into oh. Which an unfortunate number of people do. Sorry man but it’s Oubi. おうび which is O U BI. So no ohbi since the japanese dont have a kana for “OH”. “OH” is wacky… but saying it’s always “OU” is like being some weeaboo that thinks that the correct romaji is always the keys you use to type the kana on the keyboard. Each is as bad as the other. If you want to romanise it correctly, you are supposed to use “Ō”. Incidentally, listen closely to the lyrics in songs when the singer does break up the two sounds. You will hear O + O and definitely not O + U. “Oh” is commonly used as a ronamization of おお (oo). Granted. However we are not discussing over spelling issues. We are discussing as to the correct translation NOT transliteration of the school name. In the game it is stated, said and written that the name is OHBI. That is not to say that the correct Japanese is not OUBI, however that is not the translation that Overdrive have opted to use in the game, album or merchandise associated with the visual novel. Awesome news about KKCC, the EUR 20 price point is good stuff. Is this one shorter or longer than the first game? It’s a bit shorter than the original, but it is also fairly longer than Edelweiss Eiden Fantasia. Sorry about that, but I searched everywhere, and I didn’t find a e-mail adress. I wanna know, if I translate Umineko in french (just the script and the pictures, not the games mechanism), would Mangagamers be interested? Mod: I fixed you up! No, it is just chapter 6.
well considering their justification for the prices was the Japanese releases its worth mentioning. “20 euros isn’t that bad”? Are you intentionally being blind or foolish, and not noticing that you will have to pay this amount FOUR TIMES to get the entire story? Are you the kind of idiot who buys things on TV because it’s “just 6 easy payments of 19.99”? By the time you buy all four, it will be 80 EUR. It’s worth noting that even right now, the Japanese version can be obtained for 1/4 of that price. And you will get the entire story in one go. The only problem with getting the original in Japanese is that it would be in Japanese. It’s not something everyone can read and automatically know everything they’re reading about. Besides, it’s not like all people would pay 80 euros all at once. Yes, I know that counts as 110 dollars or so, but it’s not like saying that will stop everyone from wanting to get the full picture. I think having a job really helps to offset the fear of paying more than nothing for something. Sure, there might be a reason for the pricing but as a consumer I only see the “drug dealer model” where the first of a series is sold at a reasonable price to get people hooked, and then the remainder is expensive. Like all consumers, I merely ask for a reasonable price. This isn’t the same as refusing to buy anything at all. The price on MangaGamer’s translation of the question arc might have still been steeper than the Japanese version of it, but it was at least still reasonable. Can’t wait for KKCC, awesome. Awesome! I’m glad to hear about Higurashi, since frankly I was starting to wonder if the price hike coupled with the long wait meant that you guys had decided not to bother completing it. I’ll probably still be holding off on buying the second half until the second half is complete, though. By the way, will the bug where saved games occasionally spontaneously disappear be fixed in this release? I’ve been hearing a lot about that problem, and with the release of patches for fixing your grammatical errors that’s the biggest thing keeping me reccing against friends buying from you. So, will the higurashi series be release monthly? Can we expect chpter 7 to may? Depends on the schedule of the insertion and QC department. The script has gone through extensive proofreading already. 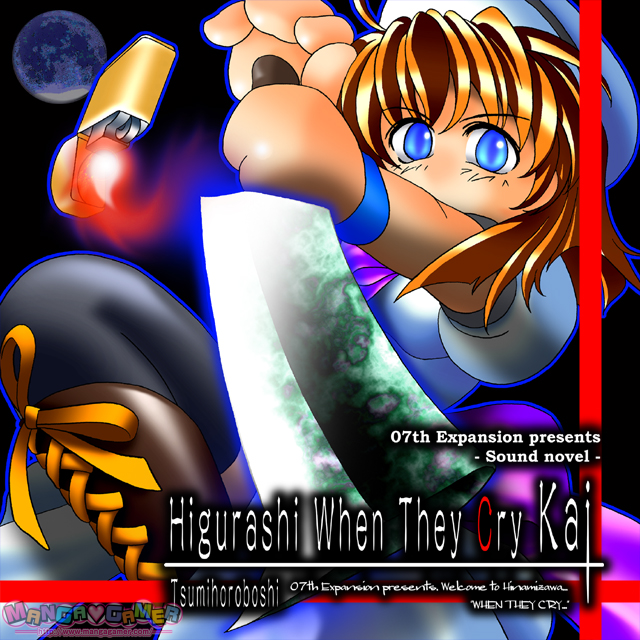 Are there any plans to release a complete bundled version of “Higurashi When They Cry Kai”, containing all four chapters from that part of the series, at some point in the foreseeable future? No objections to the current releases, though. It’s thanks to you people that I get to understand the complete story of Higurashi that the fan translations have yet to cover. My only true concern, however, which may be partially unrelated to the subject I’ve brought up, is whether there is a limit to how long your releases will be available, and how long it would be if there is. So far as I know, there are currently no plans to remove the bundle packs from our catalog. Should such a plan ever arise, I will inform the public so you all have a chance to purchase them before the bundles are removed. As for Higurashi, perhaps there will be a bundle in the distant future, perhaps not. We haven’t decided yet. If such a bundle were to be released, it would most certainly be after all of the arcs have been released. Personally, I found Tsumihoroboshi to be quite enjoyable. By the way, I have a question. Will you guys translate Deardrops? Does this release add back in the original Higurashi tracks that was removed? Or did you people still left them out? I believe the issue was with the tracks for the question arcs, not the answer arcs. I’ve heard no news of any tracks being removed for those releases. Well here’s the news. I’ll just copy and paste the thing. “So I was going through the Music Box of the JP version, checking where they were used so I could upload them to Youtube with an appropriate picture, but noticed that Depressive Paranoia, Mienu Mirai and Solitude never were used in the MangaGamer version. For example, Mienu Mirai was replaced by Digital Network in the scene where Shion escaped from St. Lucia, and Confession replaced Solitude, leading to it being used in almost every scene near the end. They tried to fool us, though, by saying that “the tracks by Dai that everyone wants” are still there. But since Tack, DJ Neta and Suebashi’s tracks were removed, we’ll end up missing out on some of the greatest tracks such as Assault Operations (Matsuribayashi BGM, a rock/metal song that’s kind of like the Mortal Stampede/Victima Propiciatoria of Higurashi). Maybe there will be music patches to fix that, if “fix” is a word you’d like to hear. I mean, there were patches made for the question arcs, though the only thing I know for certain is that they replaced the repetitive MangaGamer tracks with a number of the original tracks. Don’t know if it’s all of them, but I still feel fulfilled with those. I’m fine if MangaGamer eventually corrects these missing Original soundtracks in the “Kai” arcs of Higurashi. But this shouldn’t have happened in the first place.